We finally got some significant rain on our side of town. I wasn't expecting rain on Saturday so I took my 2 dogs and went out to my old place to pick up some things and check for leaks. Everything was just as I left it. Kind of a frozen time capsule of my past life. I got some more clothes, hangers and old sheets for the dogs. It would take me months to get everything cleared out of there. While I was there it started raining. I was a little worried that I would get stuck out there if the wash started to flow over the road but it didn't. My mother called and said that it was raining hard at my house and my tarp was filling with water. She ran out there with my nephew to bail it out so that I wouldn't rip. She can officially say she has experienced an Arizona monsoon. You can't say it until you have run out in the middle of it to try and save something while getting wet and muddy and ruining your shoes. The next day it started to rain again. I poked 2 holes in the tarp so that it would drain itself and then I spent a few hours digging small trenches in the yard to encourage it to drain. The person who built my wall did not include drain holes so the yard fills up. 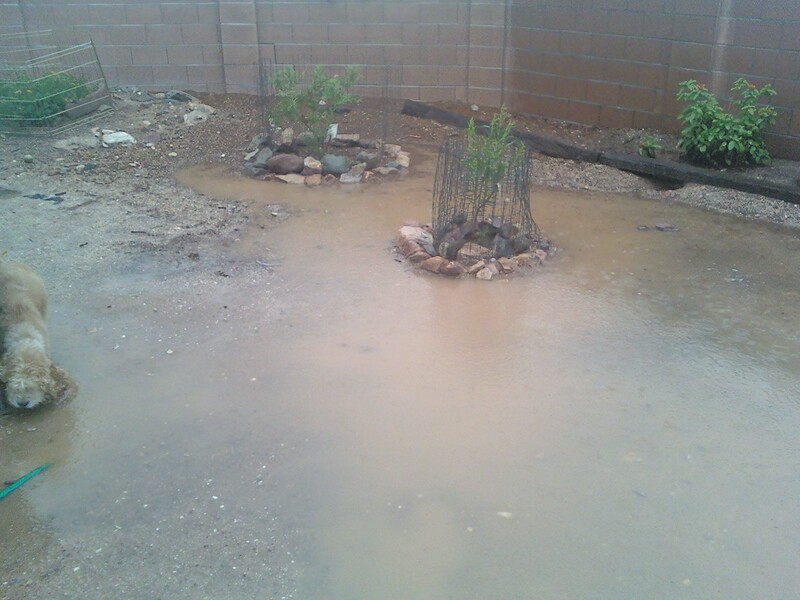 I dug a trench to the RV gate and that started the water flowing out. 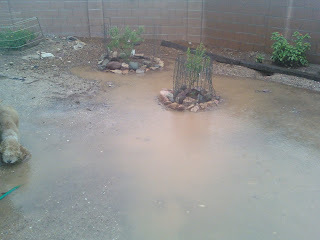 Then I dug trenches around my new trees so that some water would stay and soak in. The water stays on the surface and if you dig down 6 inches you will find dry dirt unless you force the water to stay there and soak in. Now that Century Link has FINALLY buried their cable in my yard, I can get on with planning some gravel, rocks, stepping stones and maybe even a patch of grass. That will be fun when the weather is cooler. In the meantime, the bathroom project is about to begin. My mom ordered the laundry sink and the shower stall today for delivery next week. The handyman will be here early next week. I hope we don't run in to too many problems and that it turns out how my mom wants it. In theory it will make life a little bit easier. Looks like my garden but without the grass. Have you thought of leaving your nephew out int he garden,, just to look after things, not to be mean obviously! Ha! Well, he's in school all day now so that wouldn't work. It doesn't rain that often, I mean really hard like that. Only a few drops today. Not even enough to make a puddle.